Today was Working Women Wednesday on That Business Show with Jamie Meloni and I had the pleasure of welcoming two accomplished and entertaining ladies in studio today. 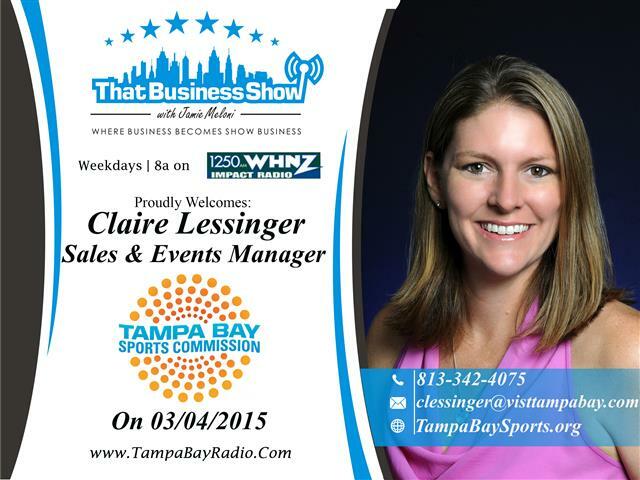 First on was Claire Lessinger, Sales and Events Manager with the Tampa Bay Sports Commission. Claire spoke of her role in the upcoming Women’s Final Four Tournament that Tampa is hosting this year at the Amalie Arena and the legacy programs associated with this great event. Claire has an extensive sports background as both a player and coach in Volleyball. She was named the Tampa Tribune’s 1992 High School Athlete of the Year and the 1993 High School Female Athlete of the Year during High School and served as the head volleyball coach at the University of South Florida for eight seasons and seven seasons as the assistant head coach. Learn more about how to get involved with The Tampa Bay Sports Commission as a volunteer or to learn more about upcoming events by visiting their website located at http://www.tampabaysports.org. Claire can be reached at 813-342-4075 or email at clessinger@visittampabay.com for more information. The 2nd half of the show was all about Shannon Spring, humor consultant and owner/founder of Just Humor Me. This is a fascinating and unique business model whereby she brings humor workshops into your workplace. She has worked in this space for 12 years and brings with her a Masters Degree in Education from The Citadel as well. As an inspirational humorist, Shannon incorporates comedy, stories, games and a whole variety of creative techniques when teaching or speaking on how to add more joy to your life and work. She served as the Humor Coach on a segment for ABC’s LowCountry Live Show and in 2003, she received recognition by winning the 40 Under 40 Award given by the Charleston, SC Regional Business Journal for outstanding business achievements and dedication to the communication. Be sure to consider Just Humor Me for your next business meeting to add some fun and humor to the environment. Learn more at http://www.justhumorme.com or contact Shannon directly at 727-483-0400 or email at shannonspring@justhumorme.com!